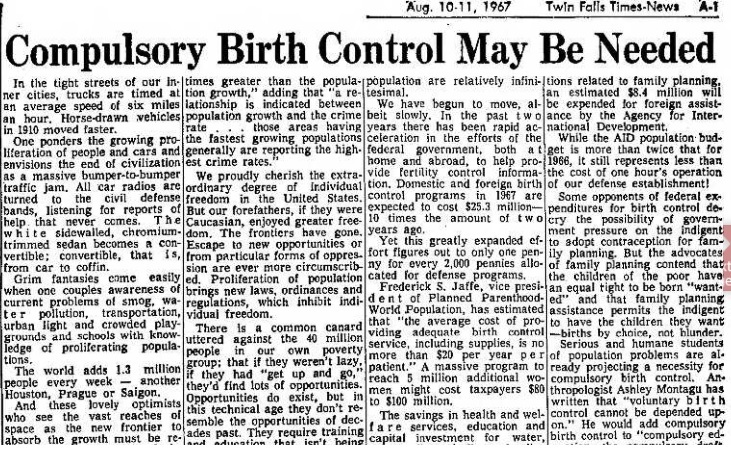 In a previous article in this series on the eugenics and class warfare agenda behind federally funded population programs like Title X and others, I detailed how minority leaders quickly became suspicious of the government’s push for “family planning.” This article will document the beginning of this agenda and how suspicions of these programs targeted at “low-income,” impoverished Americans continued. Before eugenists and others who are laboring for racial betterment can succeed, they must first clear the way for Birth Control. Like the advocates of Birth Control, the eugenists, for instance, are seeking to assist the race toward the elimination of the unfit. Both are seeking a single end but they lay emphasis upon different methods…. Eugenics without Birth Control seems to us a house builded upon the sands. It is at the mercy of the rising stream of the unfit. Sanger’s statement could almost be described as prophetic. Fears of the overpopulation of certain people groups were and are common in eugenics circles. By the 1960s, as discussed in part one of this series, fears of overpopulation were again being driven by organizations with ties to eugenics, pushing for federal dollars to reduce the births of the poor. 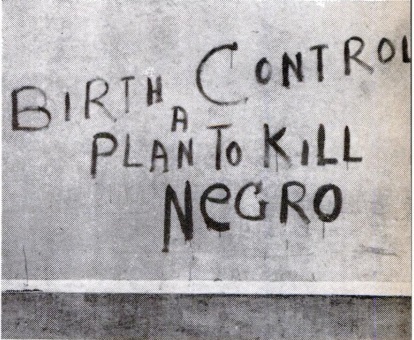 This was met with resistance in the United States, where there was a growing concern that the push for federally funded population control was motivated by a sinister plot to limit the births of Blacks and other minorities. 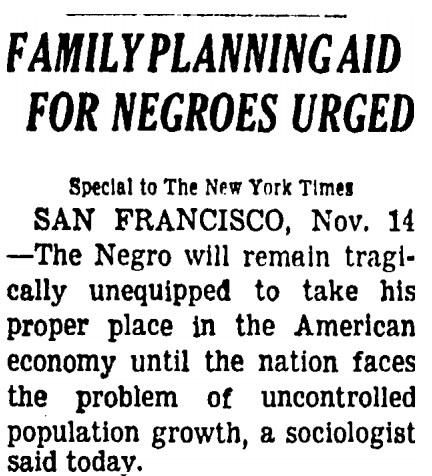 After all, years of eugenic programs, had already been aimed at sterilizing Black Americans, so why wouldn’t federally funded “family planning” programs also target those populations? 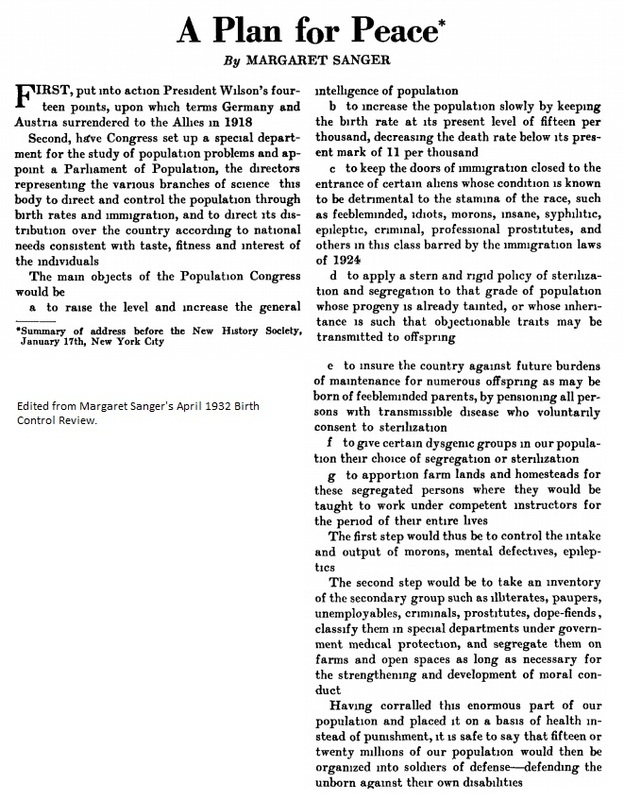 …Second, have Congress set up a special department for the study of population problems and appoint a Parliament of Population, the directors representing the various branches of science this body to direct and control the population through birth rates and immigration, and to direct its distribution over the country according to national needs consistent with taste, fitness and interest of the individuals. …The second step would be to take an inventory of the secondary group such as illiterates, paupers, unemployables, criminals, prostitutes, dope-fiends, classify them in special departments under government medical protection, and segregate them on farms and open spaces as long as necessary for the strengthening and development of moral conduct. Having corralled this enormous part of our population and placed it on a basis of health instead of punishment, it is safe to say that fifteen or twenty millions of our population would then be organized into soldiers of defense-defending the unborn against their own disabilities. … [A]s described… at the Institute for Family Studies, 2017 fertility rates have been published, and show a 40 year low at 1.76 lifetime births per woman, with the most dramatic declines expressed in “missing births” over the past decade, occurring among Hispanic and African-American women, whose fertility rates are now, while still higher, much closer to the already-low rates of white non-Hispanic women. 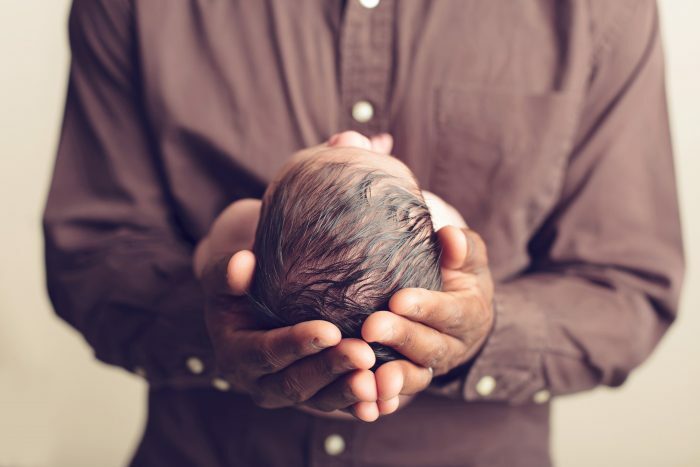 Specifically, the fertility rate for black women dropped from 2.15 to 1.89, and that of Hispanic women dropped from 2.85 to 2.1 in the time period of 2008 – 2016, compared to a decline from 1.95 to 1.72 births per non-Hispanic woman. 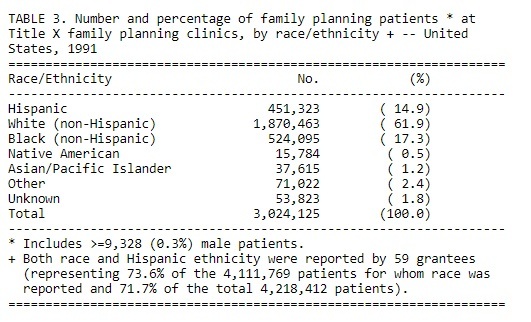 Out of the 4 million family planning clients who Title X serves, more than half are women of color: 30 percent identify as either black or African American, Asian, Native Hawaiian or Pacific Islander, or American Indian or Alaska Native, and another 32 percent of clients identify as Hispanic or Latino. 21 percent of all Title X clients identify as black or African American, and 30 percent identify as Hispanic or Latino, while African American people and Hispanic and Latino people make up 13 percent and 17 percent of the U.S. population, respectively. The figures show an alarming increase in users among the Black and Hispanic communities, specifically. This means that poor, minority women are likely more highly targeted for population control services through federally funded “family planning” programs than in the past. The Black Panther party considered contraception only one part of a larger government scheme of genocide. Drugs, venereal disease, prostitution, coercive sterilization bills, restrictive welfare legislation, inhuman living conditions, “police murders,” rat bites, malnutrition, lead poisoning, frequent fires and accidents in run-down houses, and black over-representation in Vietnam combat forces all contributed to the malicious plan to annihilate the black race. Whitney Young, leader of the Urban League, revoked his group’s support of contraception in 1962. Several local NAACP chapters followed suit. Marvin Davies, head of the Florida NAACP, rejected contraception and argued that black women needed to produce large numbers of babies until the black population comprised 30-35 percent of Americans; only then would blacks be able to affect the power structure. The United States is already over-populated. We must stop all immigration and impose birth controls. Those genetic types within each race and stock having better traits will be encouraged to produce more offspring and those having the lesser qualities will be restricted in the number of their offspring. But advocacy of “family planning” programs was strong and the push was coming from top leaders, including the President of the United States. In 1965, President Lyndon Johnson (LBJ) lent his support to taxpayer funded “family planning” efforts within the U.S. and abroad, claiming in a speech that for every five dollars spent on population control, more than a hundred would be invested in economic growth. For implementation of an “affirmative and effective population policy at home and abroad,” President Johnson was bestowed Planned Parenthood’s highest award (the Margaret Sanger Award). 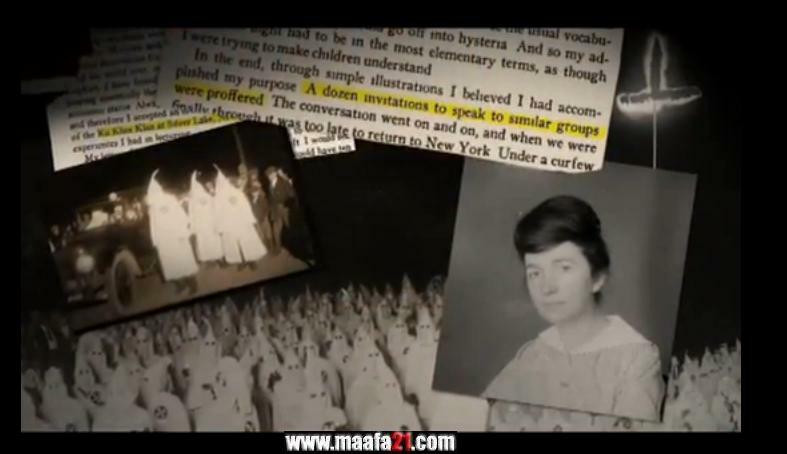 Planned Parenthood had its roots in eugenics; founder Margaret Sanger was a member of the American Eugenics Society, who stacked her board with leaders of the eugenics movement and even willingly spoke to members of the Ku Klux Klan. 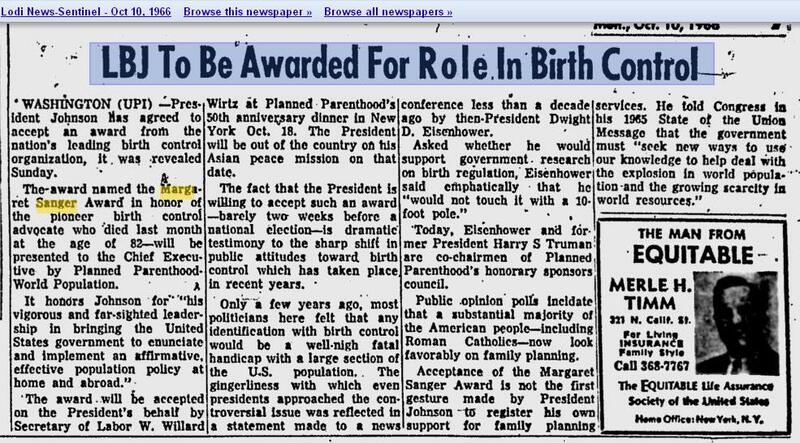 Simply changing the organization’s name from the American Birth Control League (under Sanger’s leadership) to Planned Parenthood did not erase Planned Parenthood’s eugenics ties. 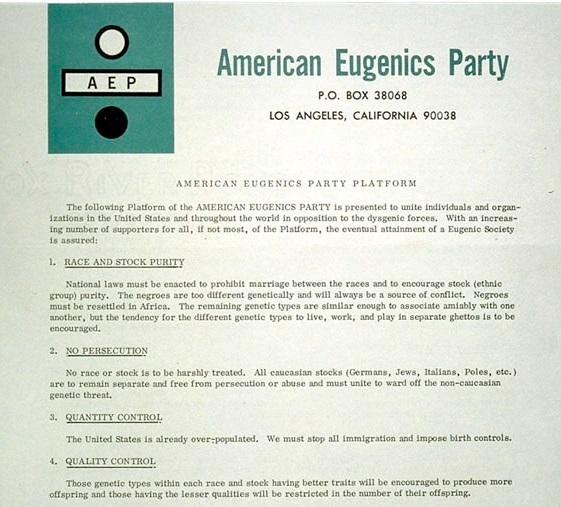 You can trace the organization’s deep ties in eugenics well beyond their name change in 1942, and that philosophy has been carried on throughout its history. 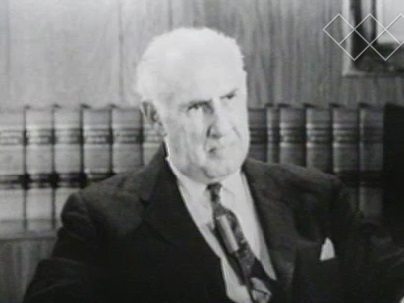 Planned Parenthood‘s medical director during this time (1962) was a doctor by the name of Alan Guttmacher, a former VP for the American Eugenics Society and founder of Planned Parenthood’s research arm and “special affiliate,” the Guttmacher Institute, who later went on to become president of Planned Parenthood. Guttmacher was also a eugenicist, joining others of his day in voicing a concern about rising population growth. Guttmacher did not discount the idea of coercion. 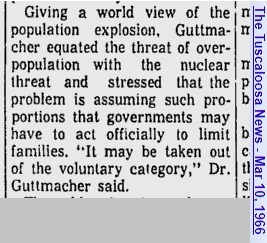 In 1966, Guttmacher compared the world population with the threat of nuclear war, telling the Washington Post that governments may have to act officially to limit families. “It may be taken out of the voluntary category,” Guttmacher said. Although Guttmacher can be credited as the mastermind behind the push for abortion at Planned Parenthood, he also helped craft the push for taxpayer funded family planning. The 1967 Social Security Amendments earmarked 6 percent of maternal and child health funds for family planning, officially sanctioning the Children’s Bureau’s involvement in these services for the first time. By 1968, nearly all States were providing some form of family planning through this program (up from 20 States just 4 years earlier), bringing assistance to more than 420,000 women. In addition, the Maternity and Infant Care projects under the Department of Health, Education and Welfare (DHEW) supplemented the EOA [1964 Economic Opportunity Act (EOA)] effort by funding family planning services through city health departments. 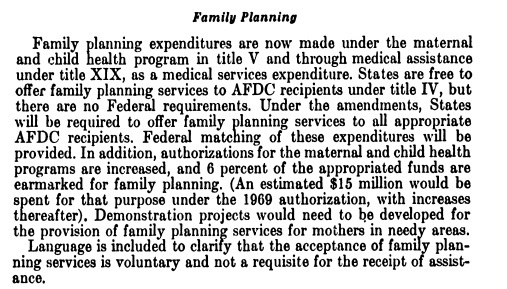 From fiscal 1967 to fiscal 1970, federal funds allocated to family planning increased to roughly $600 million (in 2010 dollars), over 10 times their level in 1967. In part three of this series, Live Action News will detail how the population control movement recruited a Republican president to push this agenda. Additional articles on Title X’s history are included (Parts one, two, and four), as well as Planned Parenthood’s Blueprint and George HW Bush’s relationship to TitleX and Planned Parenthood.